FILE - President Donald Trump speaks about his plan to combat opioid drug addiction at Manchester Community College, March 19, 2018, in Manchester, New Hampshire. U.S. President Donald Trump on Sunday rebuffed the notion he is having trouble assembling a top legal team to defend him in the Russia probe, even as two lawyers announced as joining Trump's defense won't be after all. A former federal prosecutor, Joseph DiGenova, and his wife, Victoria Toensing, agreed last week to help represent the U.S. leader. But within hours of Trump saying in a Twitter remark that he is "very happy" with his legal team, his personal attorney, Jay Sekulow, said that DiGenova and Toensing would not be among the lawyers defending Trump against allegations that his 2016 campaign colluded with Russia to help him win and then obstructed justice to thwart the investigation. "The president is disappointed that conflicts prevent Joe DiGenova and Victoria Toensing from joining the president's special counsel team," Sekulow said in a statement. "However, those conflicts do not prevent them from assisting the president in other legal matters. The president looks forward to working with them." The latest shuffling of Trump's legal team came days after his lead lawyer, John Dowd, quit, while another top Washington lawyer, Theodore Olson, declined to join Trump's defense. On Twitter, Trump said, "Many lawyers and top law firms want to represent me in the Russia case. Don’t believe the Fake News narrative that it is hard to find a lawyer who wants to take this on. Fame & fortune will NEVER be turned down by a lawyer, though some are conflicted. Problem is that a new lawyer or law firm will take months to get up to speed (if for no other reason than they can bill more), which is unfair to our great country — and I am very happy with my existing team. "Besides, there was NO COLLUSION with Russia, except by Crooked Hillary and the Dems!" Trump added, employing his favorite epithet for the Democratic challenger he defeated, former U.S. Secretary of State Hillary Clinton. Special Counsel Robert Mueller has been investigating the Trump campaign for months. He indicted 13 Russians on charges of carrying out an online campaign to sow discord in American democracy, while securing guilty pleas from two Trump aides, former national security adviser Michael Flynn and foreign affairs adviser George Papadopoulos, for lying to federal investigators about their contacts with Russian officials. 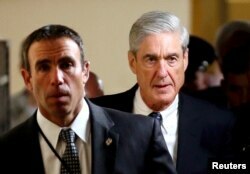 Mueller's office and Trump's defense attorneys have been negotiating over terms of possible testimony by Trump about his actions linked to Russia and the ensuing investigation. Trump says he wants to do the interview, but no agreement on his questioning has been reached. FILE - Special Counsel Robert Mueller (R) departs after briefing members of the U.S. Senate on his investigation into potential collusion between Russia and the Trump campaign on Capitol Hill in Washington, June 21, 2017. Mueller is believed to particularly want to question Trump about his knowledge of a mid-2016 meeting his eldest son, Donald Trump Jr., set up at Trump Tower in New York, with a Russian attorney on the premise that she was going to hand the Trump campaign incriminating information about Clinton, as well as Trump's role while president in helping draft a misleading statement about the meeting. In addition, Mueller's lawyers want to question Trump about his firing of Flynn in the first month of his presidency and later his ouster of FBI chief James Comey, whom Trump fired while Comey was leading the Russia probe. Mueller, another former director of the Federal Bureau of Investigation, was named shortly thereafter, over Trump's objections, to take over the Russia investigation. In other Twitter remarks, Trump defended his reluctant approval Friday of $1.3 trillion in funding for government operations through the end of September. 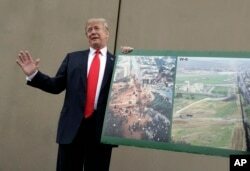 FILE - President Donald Trump holds a photo of the border area as he reviews border wall prototypes, March 13, 2018, in San Diego. Trump had sought $20 billion or more to pay for construction of a wall along the U.S.-Mexican border to thwart illegal immigration, but had to settle for $1.6 billion. "Much can be done with the $1.6 Billion given to building and fixing the border wall," Trump said. "It is just a down payment. Work will start immediately. The rest of the money will come." He blamed Democrats for not agreeing to a bigger wall deal with a companion agreement to block the deportation of 1.8 million young people who years ago were brought illegally into the country by their parents. Trump said with $700 billion in funding for defense, "many jobs are created and our Military is again rich. Building a great Border Wall, with drugs (poison) and enemy combatants pouring into our Country, is all about National Defense. "Build WALL through M!," with Mexico paying for it, Trump implored, revisiting one of his favorite pledges from the 2016 campaign. Long-Awaited Mueller Report Is Finally Out — Now What?